After completing my order the kiosk I moved over to the kiosk/internet order pickup desk to wait only about a minute for my food to appear. I spent that minute thinking to myself who would actually pre-order their McDonald's online in advance and then go pick it up. I was there during Friday lunch hour and it was pretty busy. Due to ordering at the kiosk still I had my meal extremely quickly, much quicker than I would here in Singapore. If you ordered online anywhere but actually already inside the restaurant, it was going to be ready long before you could get there to pick it up. Those thoughts soon faded once I had my food. I'm always a bit disappointed when a promo burger is served in a plain box, and this was no different, since it was in a nondescript yellow box. But I was a little bit more impressed once I opened that box, since the burger within actually looked really good. The special bun was a very soft, ciabatta-style bun and the beef looked as thick as it did in the promo photos, it was wider than the bun by a considerable margin. To be honest, if I had another variant of The 280 to choose from, I probably would have tried it over this one, since the thought of 4 cheeses on a single burger seemed like a bit much and truthfully, it probably was (blasphemy, I know). The special bun was one of the softest buns I've ever had at McDonald's, but it's flavour was a bit on the weak side. There was so much cheese on the burger that it hid the taste of the bun and any seasoning on the beef, and even though there were 3 large pieces of tomato, you could barely taste it. As expected, the weakest of the 3 different cheeses was the processed cheddar. Rather than include 2 slices I would have preferred if the swapped it for more veg, but I can see how if you were having a standard 280 you would need more than just the single emmental slice. 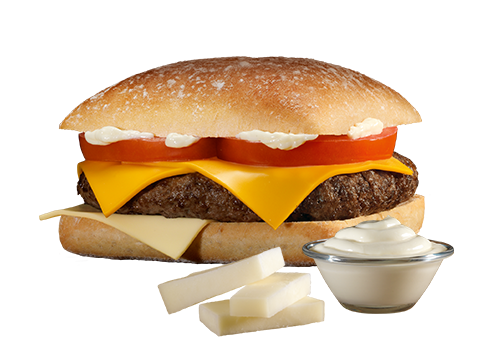 Whereas the cheddar slices and the cheese sauce were between the top bun and the patty, the emmental slice was between the patty and bottom slice. Calling it a "slice" isn't that true, since it was so melted that it was essentially a sauce of it's own. If you look at the photo below, I had to take a peek down there to see what was going on, and why there wasn't an actual slice of cheese like I was expecting. The cheese was there, and it had a surprisingly nice and distinctly swiss-cheese flavour, I just hadn't seen a piece of cheese melted that well on a McDonald's burger before. The standout part of this burger was clearly the cheese sauce. Not only was there a big glob on there, but it had a taste that was a cross between a high quality soft French cheese, and those processed spreadable cheese triangles. A couple years ago McDonald's France had a Comté cheese sauce variant of The 280, and I have a suspicion this could be the same burger but re-released under a different name, it certainty tasted close enough. There were 3 burgers I wanted to try during our stay in France, and my wife decided that we try this one first as she was most excited about this one. The burgers in Asia rarely have any special cheeses, and what better country than France to have a burger with both a premium bun and good cheese? I tried Breakfast at a McDonald's in Paris it was awful. Always tried a McDonald's when ever I was stationed overseas. Most were good to ok. But the one in Paris was really awful. The one I loved was in Chinhae South Korea Mcdonald's there I loved things like it did delivery and the bulgogi burger was great. Always ordered that one. Macdonald's and any other fast food here in France and Belgium are really expansive. I can't believe how much cheaper it is in the usa. You guys have some menus for 1 dollard lol, this is crazy. the kiosk system made mcd a lot more annoying. even if it may speed up the average order (which is all mcdonalds cares about, of course) waiting time for items made previously to you entering - like the standard cheeseburger - is longer now than with the traditional system of the guy behind the counter giving you the stuff right when you paid.